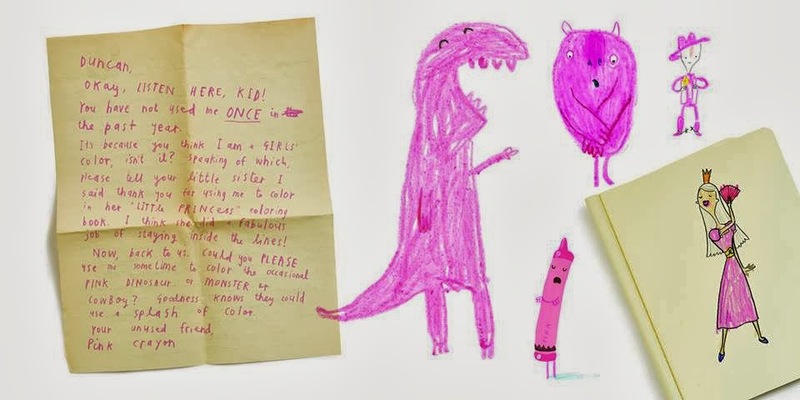 As you may already know, Oliver Jeffers is my favourite children's book author and illustrator. His stories often centre on a little boy and his adventures, be it trying to catch a star or helping his penguin friend learn to fly. His books are sweet and beautiful to look at and his lastest release is really fun. 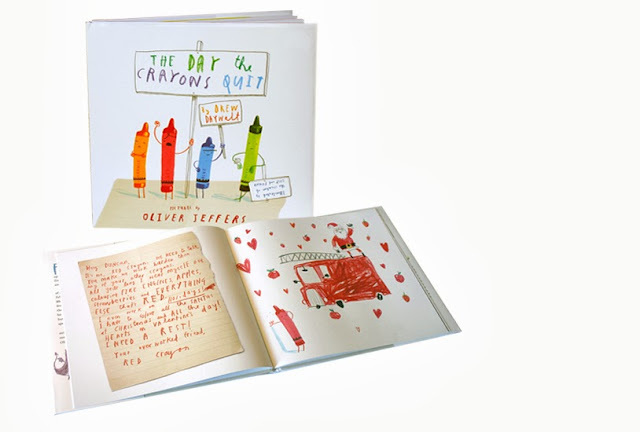 The Day The Crayons Quit is written by Drew Daywalt and illustrated by Oliver Jeffers and is about all the different colour crayons in Duncan's box going on strike. Each colour writes a letter to Duncan and the accompanying illustrations show the different things that colour is often used to draw - e.g. 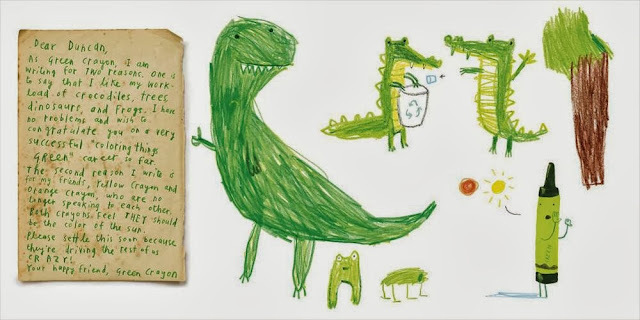 dragons and trees for the green crayon, whales, elephants and rhinos for the grey crayon etc. 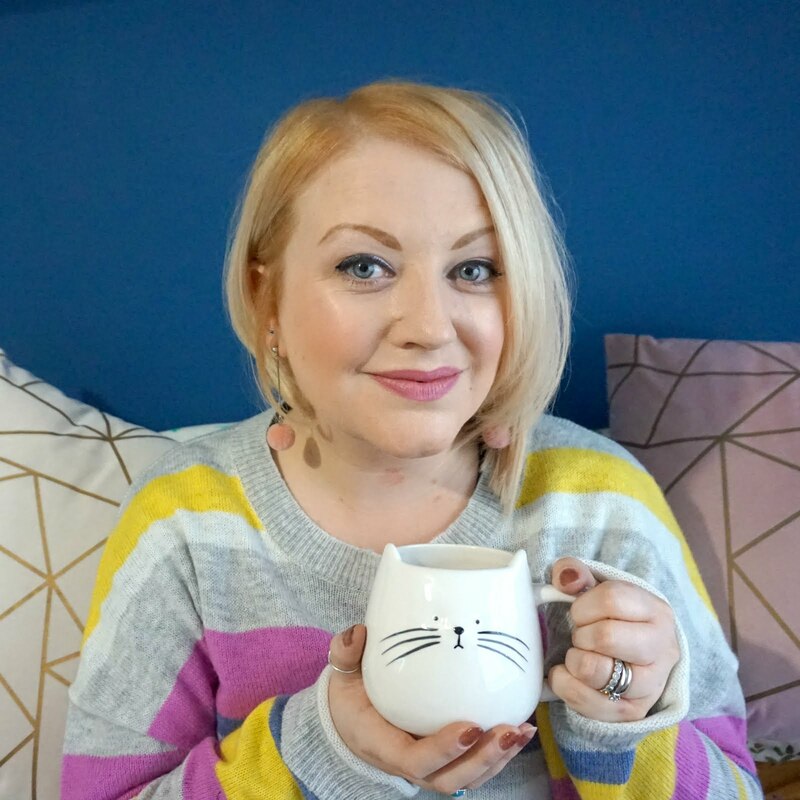 The story is humorous, and made even more so when my husband puts on a different accent for each crayon when reading it to Ethan, and the illustrations are vibrant and engaging. I actually bought the Kindle edition of the book for my iPad, as we were away at the time and I wanted something to read to Ethan. I was really impressed with how the book translates but will definitely buy a copy of the actual book to add to Ethan's library. Find out more about the world of Oliver Jeffers here. This is a fab microsite which beautifully brings to life the main characters from his books, with interactive elements and games to enjoy. 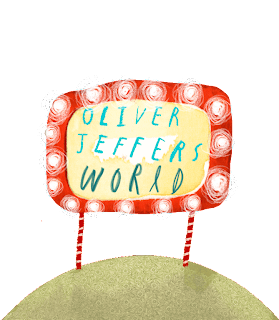 I can't wait for Ethan to be old enough to enjoy the world of Oliver Jeffers - it really is a magical place.